According to this article live versions of Immersive Media’s technology is being used for an on demand music service. Of course once you have live 360 video coverage you can still instrument that display and provide virtual augmented reality over the top, which is an interesting twist I think. It may seem a bit of a long shot to look forward to the next 10 years but what the heck! 1. Keep Walking. Obviously the big one to consider is what used to be called mobile. Everything is mobile now. We already have relatively easy access to 3g and wi-fi to allowed our technology to be untethered. Of course this needs to be wrestled away from the anti-competitive telecoms companies. The thing stifling growth is the wayward charging mechanisms. Cross country boundary charges and tariffs will be forced to change, either by regulation or by a new entrant into the market that is not a handset provider. It may be more schemes like the BT FON emerge. With that you opt into a scheme to share your home wireless with passers by who also opt in to share their home wireless. It creates a huge ad hoc network. Just imagine too if a generation of devices are made that not only receive but also transmit and act as wireless hubs. (The already exist BTW!) If the pricing model is an opt in to share you wireless access wherever you are and you get paid for encouraging others to use you mobile hotspot (as they encourages new users to access their applications) then we may see a game changer in personal comms. 2. Batteries. This has to get sorted out in the next decade. Our devices demand more and more, and we rely on them for longer so we need a sustainable and revolutionary power transmission or battery device. 3. 3d Printing. 10 years should be enough for this to become “mainstream” as by then the transmission of 3d content and design with the associated rules and regulations, kite marks, certifications etc will start to be in place. Why move goods all over the planet when you can make them locally? It really is a no brainer. 4. Games as work. Eventually enough of us will have been through the corporate mill, will also have spent a large portion of our life entertaining ourselves with World Of Warcraft and Modern Warfare 2 and even Farmville to work out that there is no reason for us as humans to druge along doing work for the sake of it that is dull and repetitive. Menial tasks can be enhanced for very little cost into levelling up entertaining, morale lifting and thought provoking activities. Work and business is a Role playing game (I have pointed this out before back on Terra Nova). Donald Trump says he is not interested in money but it helps to use it to keep score. (I guess I need to alter the game I play 😉 ). This will of course become a lot easier to do as services in the enterprise are exposed and instrumented then rendered and represented in more meaningful ways in environments like Second Life Enterprise. As with all forms of human communication some people will evolve and flourish learning to entertain and inform, to persuade and motivate using all the online tools and presence that we are able to engage with today. 5. Brands crossing digital borders. Engagement with people where they happen to want to be online and offline will have to increase. It will not be enough, as back in the early web to just leave you website lying around to be found. Business has to become a travelling exhibit, a movable market stall that can be adjusted and placed wherever people are or want to be. Digitally distance knows no bounds, but you need more than a sign post or banner ad. Active guides, persuaders, dare I say salespeople? Maybe I am referring to my evangelist brethren though? People who know the territory, have experience and speak the language working for companies, not just as a a sideline that the company takes for granted. 6. Collectives vs Corporate. I would really like to see an end to the ridiculous long statements and terms and conditions on digital content. The pages of scrolling and checkbox ticking, the multi country copyright statements on films that you cant skip (particularly kids ones). We should evolve a fair wait of policing copyright, of acknowledging the origins of an idea. I am fairly certain this charge will be led as more of us become distributed and work more as collectives online. Of course this will be cyclic as those collectives will evolve into the corporate entities we have again today but the re-arrangement will start to occur first over the next decade. 7. Renaissance – Access for All. Projects such as one laptop per child and local country initiatives to enable connectivity really are essential. We have a divided society where many of us are the monks with our illuminated apple logos enabling us to connect with the world. We have an increasing number of people who are just learning to decipher the history of our writings, but are now starting to not need to hear us read it out load, but to write their own digital histories and more importantly their future. We have a few naysayers that are worried that if everyone has access to this the world will end as we know it. I mean…. people communicating with one another and understanding one another’s cultures, ideas and needs without being brokered by a ruling class, whatever next! With a rise in education powered in part by digital inclusion at a global level I expect to see some huge innovations, upheavals and positive outcomes over the next 10 years. Putting the tech in the hands of people, but just as a tool to use however suits them, not just for the sake of a cool gadget is going to cause this generational renaissance. It has been an amazing year and I have to say a great big thankyou for all your support. To all the people I have worked with, and for, advising, building, directing in whatever capacity. To all the people who have offered to help, mentoring, contacts and to share ideas that created new opportunities thankyou too. It feels many of us are part of one big club. I have had some great collaboration conversations the last few weeks in particular and having just had a patent filed on an idea that has been brewing for a good few months there is an exciting business avenue to start 2010 with. Have a great holiday, stay safe.
) interviewed by Mitch Wagner. We have a sense of belonging. Likewise there are some celebrities from Second Life here and some old friends. It makes it better, even though we are listening in effect to a live interview. Wherever this conversation goes it will be brilliant I know. Boing Boing’s Cory Doctorow just put this article up with links to the original plea from the animator of this movie on questioncopyright.org for someone to help re-record the soundtrack and build upon this. It is a complex issue, one that usually polarises conversations, but I do like the way this side of the argument is put. The words are listed as follows. there’s one for each of us! Charlie Brooker wrote a great piece in the guardian yesterday about why he loves video games. It is still something that many people seem to close their minds too. In a way the virtual world experiences they are having will be a gateway to understanding the many forms of expression that games bring. I just completed the story line of Modern Warfare 2 (no spoilers BTW), it got to a point at the end that I was shouting at the screen. This was because the game flows in an out of being in control and having to just watch. In all movies you sit and watch, its that simple. The story may or may not engage you. However some of the set pieces have you on the edge of you seat. It may be the Terminator dragging himself towards an incapacitated Sarah Conner, it may be a massive army charging towards an outnumbered set of heroes or Bond catching up with the bad guy in a car chase. They all require you to become engaged for it to work. When you have switched into a mode in a highly visual game where you have been solving problems and that is taken away from you (in context) the sense of drama and engagement is heightened. Cut scenes used to just be a way to show some pre-rendered visuals to set the scene, but the blurring of the cut scene narrative with the restricted interaction I thought was brilliant. (I have been playing games since the 70’s). Of course games are not just one thing, one genre, one experience. They meet many different tastes and needs. The abstract cartoon style social games of Cafe World and Farmville focussed on the daily grind (just as many MMO’s such as World of Warcraft rely on) to the now much more open ended experiences. The latter being demonstrated here with Red Dead Redemption from Rockstar Games. It’s not just the graphics, physics and code its the potential for narrative and engagement for one or more people. Henri just commented on my previous blog post about Unity3d and Opensim. It would appear we have an interesting to player in the game now. 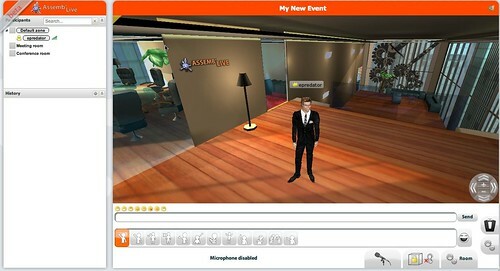 A World For Us have produced a web based virtual world meeting application using, amongst other things, Unity3d for as the engine. I had a very quick look and got a good initial guy feel. Partly this is because I know and appreciate what Unity can do. Whilst there will be lots of questions (to be answered in depth later) about whitboards, web sharing, physics and dynamic interaction etc, this just worked. Voice worked, chat worked, I did some avatar customization (no green hair though 🙁 ) I sat in a chair, I zoomed into a presentation and moved through it. Most of all it ran on my Mac! A key point about Unity is that it does not care quite so much as many of the windows based plugin’s. I have now had this conversation several times with people about the potential future that a mix of open source and open minded development may bring to the virtual world industry. Much of what is happening seems to be driven by some of the direction Second Life has taken or is taking, though not so much to follow it into corporate lockdown but to breakout and provide the flexibility and creativity that is needed for the next generation of virtual worlds. In the early days of 2006 many of us said it would be great to be able to run a Second Life server, our own one under out control. That has taken a while to start to emerge, but it has emerged as an expensive product aimed at corporate IT departments. 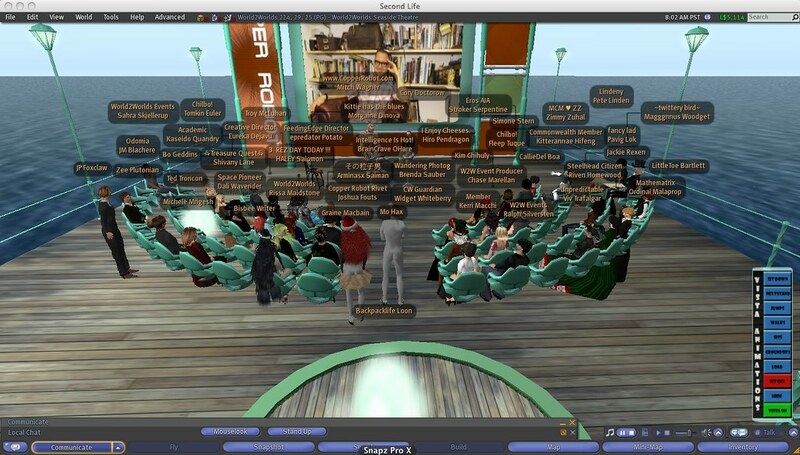 Luckily the opensource community had rallied and created the excellent Opensim. This ticks all the boxes of being able to be run locally, be run in the cloud, be provided as a service. So we have an extensible virtual world server ready to be built upon. The other component missing was a more controllable and rich interface. Yes there is the Second Life Snowglobe open source client but the need to certify and lockdown variants to align with the product needs for Second Life means that lots of the flexibility is lost. Likewise the initial open source Linden based client was under a GPL licence which caused all sorts of development to not happen at the time it really could have done with it. This is where Unity3d steps in I believe. It was Rob Smart who first started to show me this way back. Unity3d is a great front end, very flexible in how you build games and content for it. This was a movie form back in September 2008, using a message from Second Life to several unity clients to create a cube. This is loose integration, telling one place something has happened and letting the other place get on with it. Unity3d has a plugin architecture too. It runs in a browser or deploys to application platforms like mac and windows. The visuals can be made very good very quickly too. Unity3d needs a server of some sort to operate as a multiuser platform (though it does do some peer 2 peer) hence applications like Smartfox are ideal for producing Unity multiplayer and MMO style games. However Opensim has all the other layers of things needed to maintain a virtual world. It has assets databases, chat, positional awareness, server side scripting (as does Second Life that is was originally based on of course). So we have an extensible and easy to get hold of Unity3D client engine, and extensible and easy to get hold of Server/Persistence VW engine in Opensim. There may well be challenges in making the two understand one another but with the flexibility both sides of the equation that makes them very solvable. This is a high level view, Rob has some more detail here on the challenges. Add in some interoperation definition with Vastpark to help bind the two and make some mappings. Throw into the mix an open minded avatar wizard such as Evolver. There we can build avatars that we know definitely can be dropped into Unity3d. So…..I create an Evolver avatar, dropped as a resource bundle into a web deployed Unity3d client that tells the opensim server where I am in the coordinate system, and which bundle I am using. Other people with a Unity3d client see the rich detailed avatar and the shiny Unity3d environment. However we do not have to stick to that one client. Other people using a Second Life style client see the Second Life style rendering of the world? Once there is an acceptance that there can be more that one view of the data, one where people without the full equipment can still see what is going on and participate things get a lot easier to consider. Whilst a gaming assumption tends to be we all need the same view at the same speed in order to be able to have balanced gameplay (lag gets you killed) in collaborative spaces, education, meetings and art galleries this is less of an issue. As the parts of the jigsaw come together over the next year the ability to have the same experience will re-emerge. It will of course grab some headlines and it is qualitative in what it examines but it does look like providing a more interesting way of thinking about peoples value. We generally assume the money wins all the battles, the more you get paid the more you are contributing. In many cases people do become more philanthropic as they gather wealth, however as recent economic events have shown that is not always the case. Greed often sets in. To quote the headlines in the report and from the BBC tv piece. I am not making any judgements here but it does make you think a bit more about what you do and which value is the real value. I relate to this as many of the projects I work on I now look for something that is more socially valuable, not just ones that pay. If all companies and people considered this report and the social value of their contribution in general then the world would be very different place. No Mr Gecko greed is NOT good. 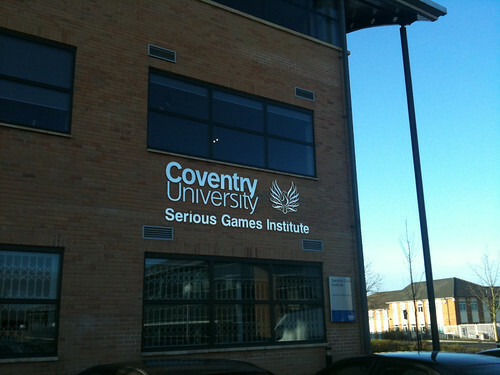 On friday I took a trip up to Coventry in the midlands to the Serious Games Institute. It is hard to believe that I have not been up there before as it really is the hub of nearly all the virtual world activity in the UK. I have been to lots of the events remotely, but it aways seemed that when we did events with SGI is timed in ways that meant Roo got to go and represent eightbar. I do however, know lots of the people who both set it up and use it from all the various other speaking engagements and conferences that there have been on virtual world use the past few years. Other virtual events also mean our patch cross, intertwine and build upon one another. SGI is home to projects like Oliver and David’s Shaspa for greener smarter buildings managed in clever and interesting ways with automation and virtual world technology. So going into the tech park at Coventry university and entering the reception felt like home to me. In the main reception there were a good few demo’s and multiple displays of various proofs of concept and projects. However there was a great piece of news scrolling on the screen that David Wortley (the director of the SGI) had been made a Fellow of the Royal Society of the Arts. I did not get to talk to David about that as he was out of the country, but it is great news. 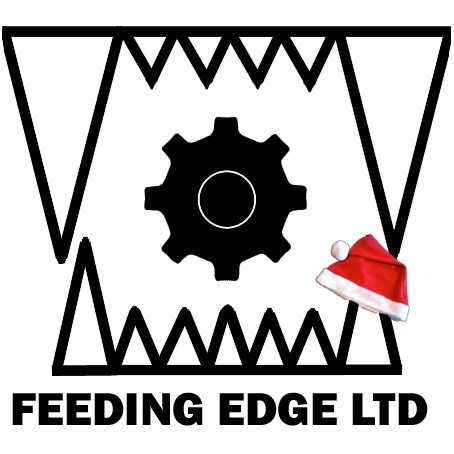 David and I were on the same bill at the Derry Awakening Creative Entrepreneurship event back in March, my first physical event with Feeding Edge. Across the way in a large room an project was being demoed and used by a large number of people with Ron Edwards from http://ambientperformance.com/ who, amongst other things, use Forterra Olive for large projects. I will do a more full post on what they were up to once they have released that to the public. It was a very interesting one to see working with a great dynamic. So for me this was great to be with so many people who I know get the potential we are all exploring and pushing and it felt I was very much amongst friends, with the great dynamic of support and competition in place at the same time. That horrible made up corporate buzzword bingo description being co-opetition. Anyway, thanks to everyone for talking and sharing and I look forward to coming up again very soon and working on some more projects.